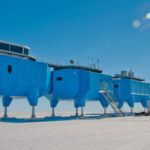 The Clean Air Sector Laboratory (CASLab) is a specialised observatory in coastal Antarctica dedicated to studies of this remote background atmosphere and the processes that influence its chemical signature. It contains a suite of instruments to measure the chemistry of the clean air and the snow surface around Halley. The laboratory supports short-timescale studies to determine and quantify controlling processes, and long-term observations to monitor for compositional change. 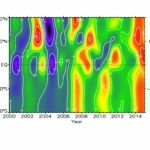 Halley is a ‘Global’ station within the World Meteorological Organisation Global Atmospheric Watch Programme, providing critical baseline observations of atmospheric composition to the international community. 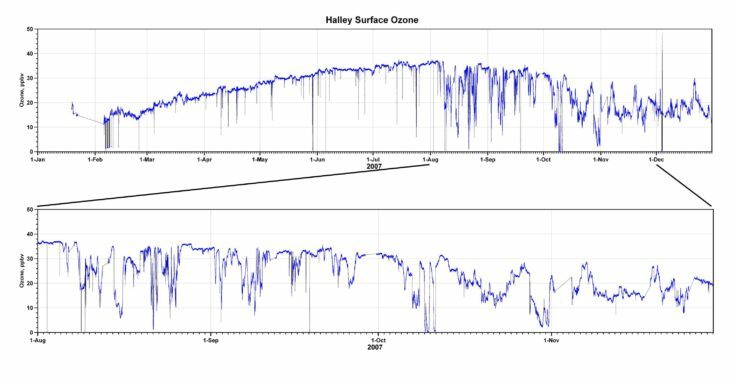 Since 1983, Halley station has contributed to the NOAA cooperative sampling network. 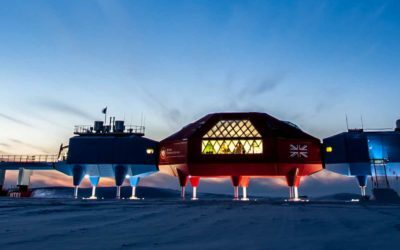 The Halley CASLab is operated by the British Antarctic Survey but with a view to work collaboratively with research groups in the UK or international science community. The CASLab is located close to the Weddell Sea coast. As the coast effectively forms a promontory at this point, the CASLab is exposed to the Weddell Sea in three directions. The surrounding area is flat and snow-covered with the nearest rock outcrops roughly 200km away. 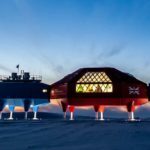 The CASLab sits approximately 30 metres above sea level on the floating Brunt Ice shelf in the Atlantic sector of coastal Antarctica. The CASLab is situated 1km from the station generators, in a clean air sector that receives minimal contamination from the base. Access to the laboratory is on foot or by ski. Vehicle access is limited to a few occasions each year for delivery of equipment. 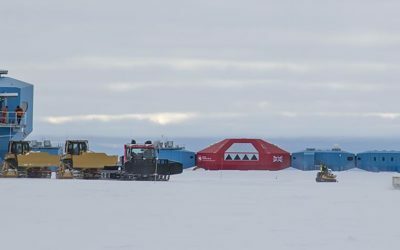 The CasLab was moved during the 2017-2018 field season as part of a three-year operational project to relocate Halley VI upstream of a previously dormant ice chasm that began to show signs of movement in 2012. The chasm could eventually cut the station off from the rest of the ice shelf. 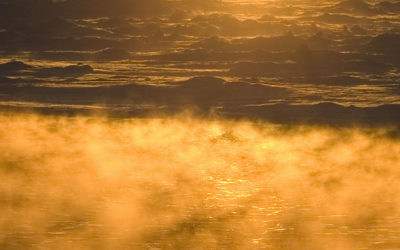 During the summer months, an open water lead, that can be several tens of kilometres wide, extends along the ice front. During the winter, open water leads form regularly when the prevailing easterly winds force sea ice offshore. In particular, Precious Bay, to the south-west of Halley, is normally ice-free during winter and spring such that air arriving at Halley from this direction (the secondary wind-rose maximum) is likely to have had contact with open water. 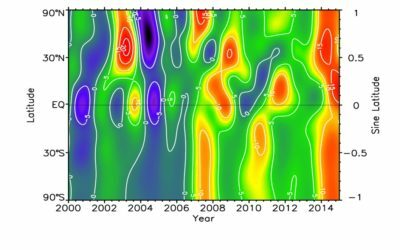 Wind speeds at Halley vary considerably through the year from very calm conditions to storms (mainly in winter/spring) gusting to 25 ms-1. 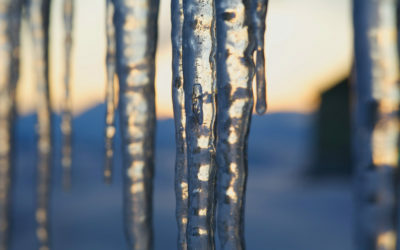 Annual temperatures range from just below 0°C in summer to around −45°C in winter. At Halley, the sun stays permanently above the horizon from 2 November to 9 February and permanently below the horizon from 30 April to 13 August. Before sun-up and after sun-down, scattered light can be observed at Halley for several hours around solar noon. The laboratory itself is constructed from three x 20ft shipping containers and mounted on a steel, legged platform. The platform is raised approximately every two years to maintain its height above the snow surface. This is necessary because of the amount of snow accumulation at Halley. 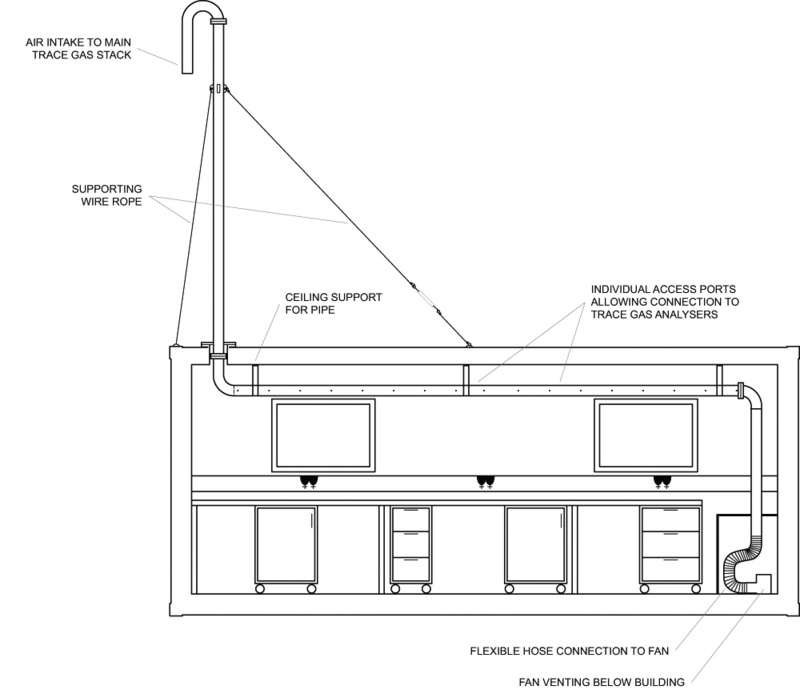 The CASLab has dedicated inlet stacks for trace gas and for aerosol sampling which are roughly eight metres above the snow surface. 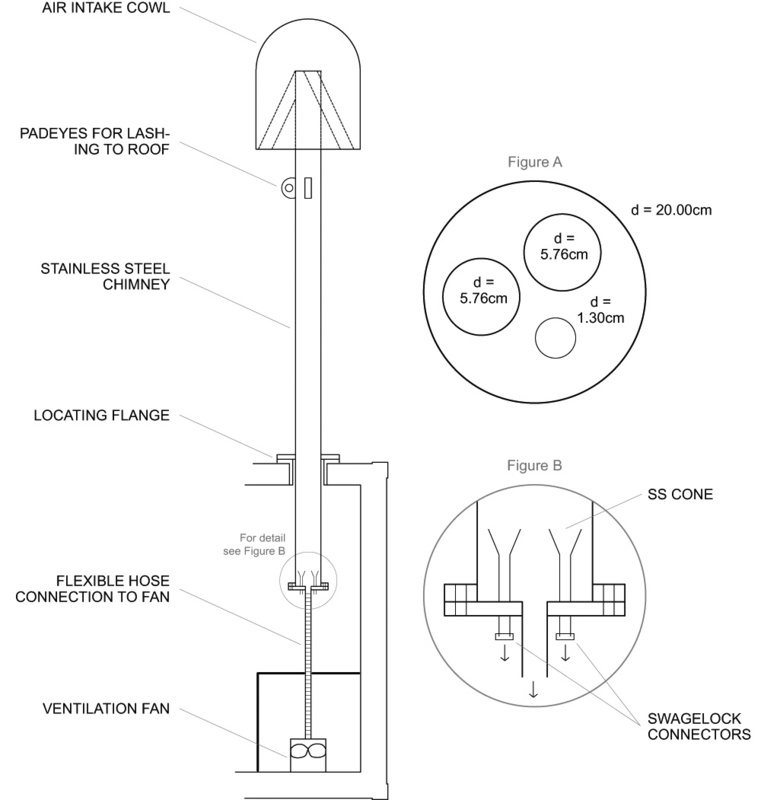 The trace gas inlet stack comprises a 100mm internal diameter (i.d.) electropolished stainless steel tube ventilated by a fan at the far end (see diagram below). The air flow through this central stack is ∼314 m³/hour, giving a residence time within the stack of less than 1 second. Samplers drawing from the stack remove only a small percentage of the total air flow. Access to the air flow is achieved via individual 1/4″ stainless steel tubing ports that penetrate to the centre of the air flow. The aerosol inlet stack comprises a 200 mm i.d. 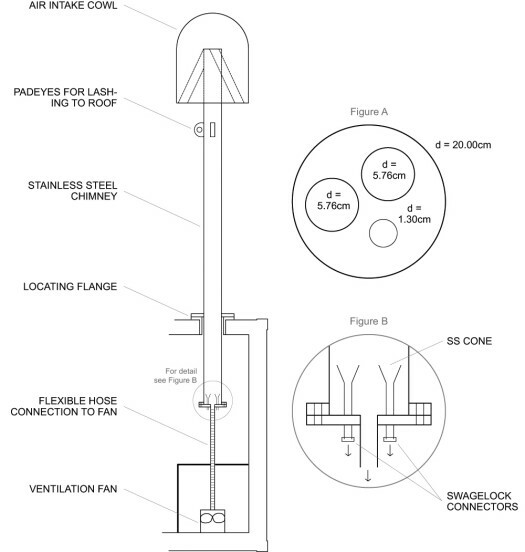 stainless steel chimney with a cowl at the air intake to prevent snow ingress (see diagram below). Ventilation is achieved using a fan with a variable flow rate. The flow rate can be altered according to the volume of air being drawn from the stack by samplers, thus enabling isokinetic sampling. Each sampler accesses the stack via stainless steel cones installed at the base of the chimney (see Figs A and B below). The area of each cone is specific to a particular sampler’s flow rate, thus maintaining isokinetic flow up to the point of sampling (see Fig A below). Samplers connect to the cones via swagelock connectors. There are various locations in the walls and ceiling of the laboratory where gland plates allow penetration to the outside world. 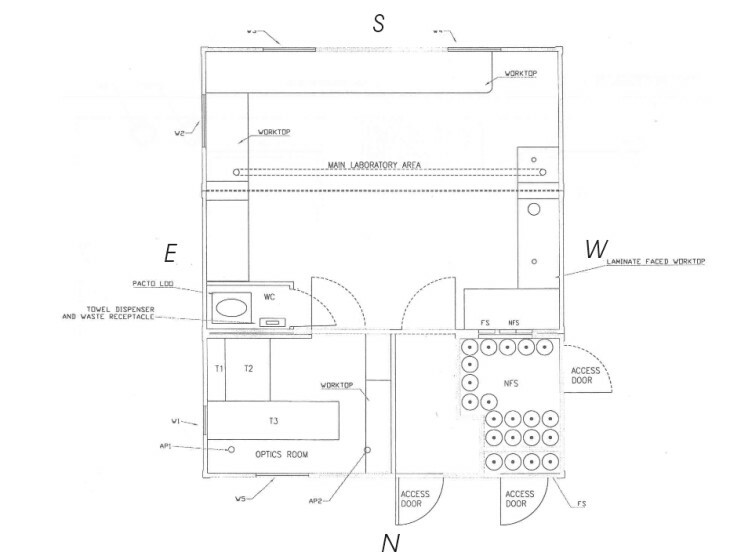 For equipment that cannot sample from the inlet stacks, dedicated inlets can be passed through the laboratory structure to equipment inside. Electricity in the CASLab runs at 240V, but a second circuit is available at 110V. There are two gas stores on the CASLab, one for flammable and one for non-flammable gases. A comprehensive gas distribution system exists for delivering gases to instruments in the laboratory. The CASLab is equipped with both high-volume and low-volume aerosol sampling equipment as well as a cascade impactor. Filter changes are done in a clean area of the lab under a laminar flow hood. 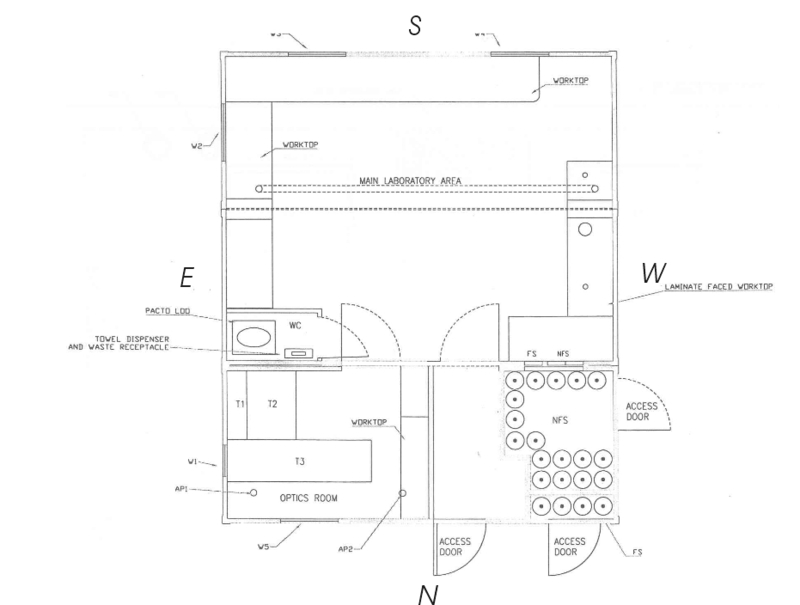 There is space in the laboratory for instruments to be either rack-mounted or bench-mounted. There is no running water at the CASLab, but any associated wet chemistry can be carried out at the wet chemistry laboratory on the main station platform. A supply of MilliQ water is available in the wet chemistry lab. 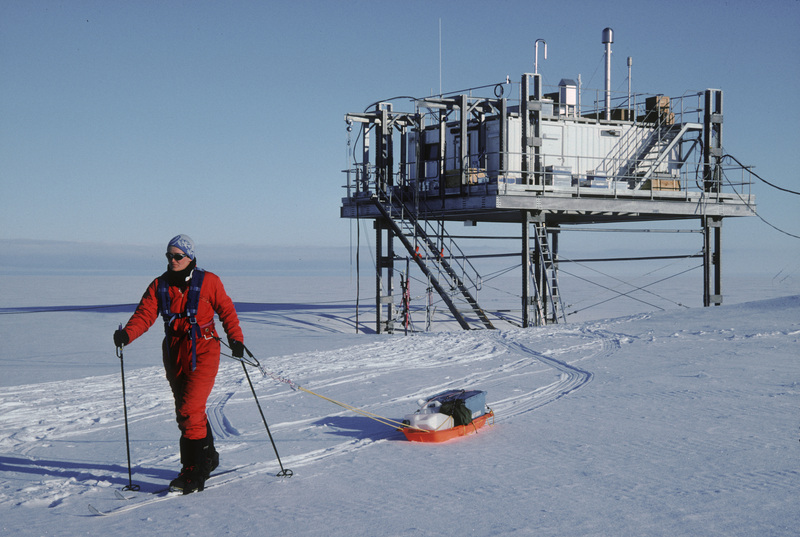 Any solutions required for instrumentation can be brought to the CASLab on a sledge. 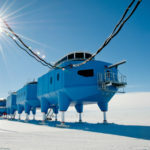 The CASLab was commissioned in 2003 at Halley V station (75°35′S, 26°34′W).It operated successfully for five years before a temporary suspension during the construction of the new Halley VI station. 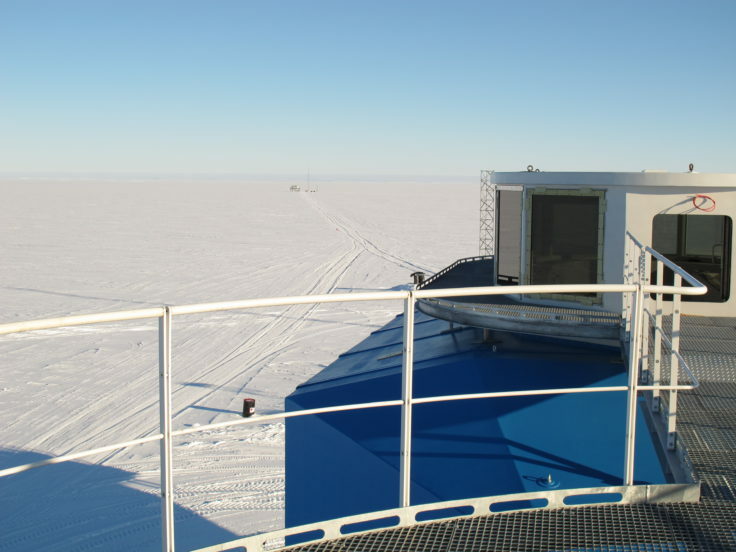 In January 2012, the CASLab was installed at its new location at Halley VI (75°35′S, 26°10′W). The new site is some 20km from Halley V, and has effectively identical environmental conditions. Rather than being an inert medium, the polar snowpack is highly chemically active and, consequently, is a major source of reactive trace gases to the overlying boundary layer. For NOx, the major precursor is nitrate impurities from which NO2 (as the major product) and NO (as the minor) are generated via photolysis. There is evidence for the photochemical production of many other reactive trace gases from snowpack impurities, including HCHO, CO, C2H2 and HONO. There is also extensive physical exchange of species such as HCHO and H2O2. Critically, many of these emissions are either a direct or an indirect source of OH, so the snowpack effectively controls the oxidising capacity of the atmosphere. 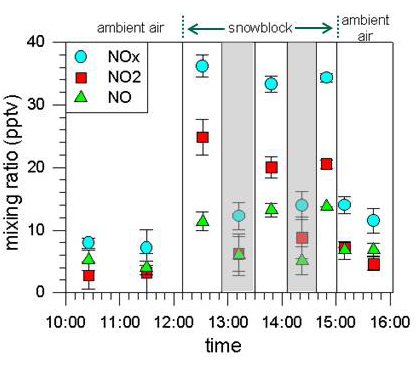 While considerable progress in understanding and quantifying snow photochemistry and air/snow exchange has been made in recent years, there is still some way to go before reliable assessments of the wider implications can be made. Tropospheric ozone depletion events (ODEs) are well-known phenomena that are observed in both polar regions during spring. Surface ozone drops from background concentrations to below instrumental detection limits (of a few parts per billion by volume). At coastal stations, concentrations can remain suppressed on the order of hours to days. 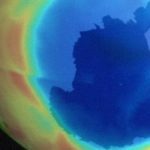 Observations over the frozen Arctic Ocean have found surface ozone to be depleted for several weeks at a time. No equivalent observations from the frozen Southern Ocean exist. Vertical profiling measurements have shown that the depletion can extend from the ground up to ∼2 km altitude. The ozone depletion is driven by halogens, with bromine compounds (Br/BrO) appearing to play an especially important role. 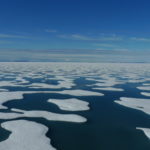 The source of Br/BrO appears tightly linked with the sea ice zone, although the precise mechanism(s) for delivering halogens to the atmosphere are still under debate. Enhanced reactive bromine emanating from the sea ice zone also causes major perturbations to the mercury cycle. Atmospheric gaseous elemental mercury is converted to more reactive forms that can then be deposition to the surrounding ecosystems. 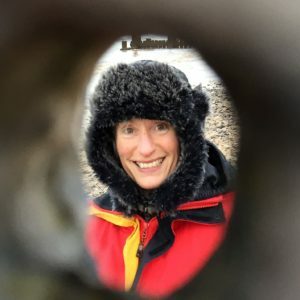 While the biogeochemistry of mercury has predominantly been studied in the Arctic, such processes have also been reported from the Antarctic. The Southern Ocean is an important CO2 sink, estimated to presently take up ∼7% of global CO2 emissions every year. 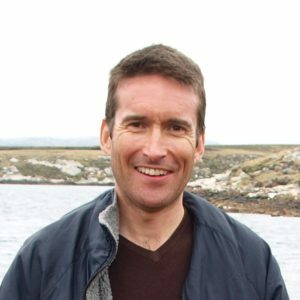 It has been suggested that CO2 uptake by the Southern Ocean has reduced in efficiency over the past few decades, as increased winds over the ocean have enhanced the natural carbon outgassing rate over that of anthropogenic CO2 uptake. This work is controversial, and a primary constraint on more definitive conclusions is the dearth of atmospheric observations in the Southern Ocean. A recent biogeochemical modelling study has suggested that Antarctic continental shelves are major, but as yet unaccounted for, sinks of atmospheric CO2. 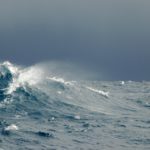 They calculated that the CO2 sink of the Ross Sea, a major embayment within the Pacific Ocean sector, is equivalent to 27% of the entire Southern Ocean. Halley lies at the edge of the Weddell Sea, the other major embayment. Air arrives at Halley with a variety of histories, including passage over the open ocean and the nearby Weddell Sea. Access to such air masses, together with the longevity of the station, makes Halley an ideal location from which to study Southern Ocean air/sea exchange. 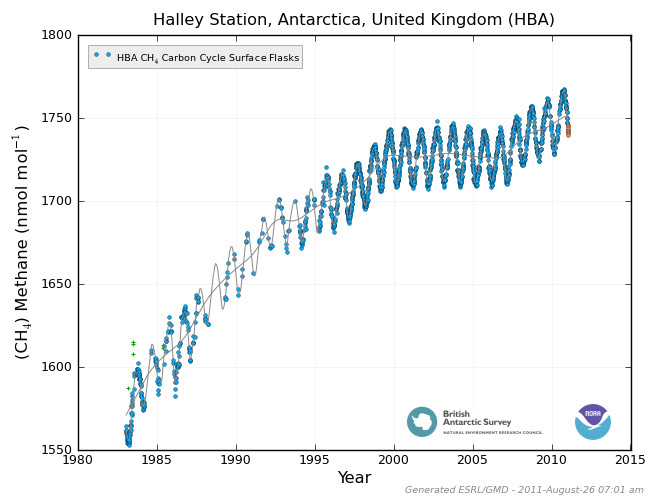 Since 1983, Halley station has contributed to the carbon cycle measurement program of the NOAA collaborative sampling network. Whole air samples are collected approximately weekly in glass flasks and returned to NOAA’s Global Monitoring Division in the US for analysis of various gases including CO2, CH4, CO, H2, SF6, N2O, 13C/12C in CO2, 18O/16O in CO2. 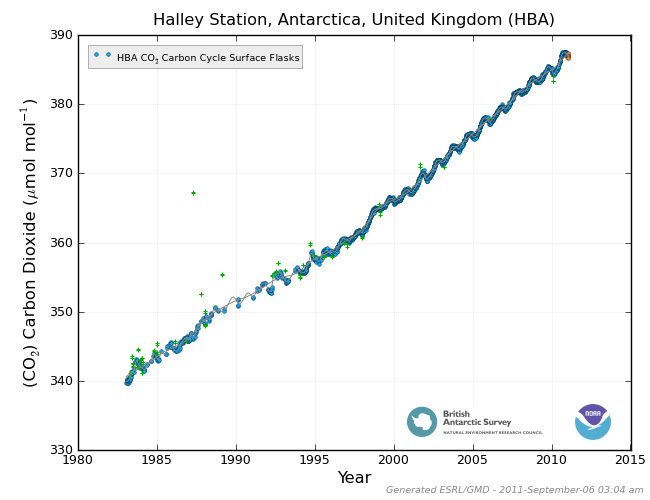 Example time series for CO2 (Conway et al., 2011) and CH4 (Dlugokencky et al., 2011) are shown below. Data shown in orange are preliminary. All other data have undergone rigorous quality assurance. A key to understanding the chemical development of our atmosphere is through study of changing chemical signatures in ice cores. They hold information on the state and composition of the atmosphere in the past, and hence how and why it has evolved. A proper understanding of the relationship between the chemical climatology of the atmospheric boundary layer and the chemical constituents in firn and ice is crucial for the correct interpretation of the cores that are used in palaeo-atmospheric reconstruction. In essence, we cannot hope to correctly reconstruct a past atmosphere if we do not properly understand that of the present day. Observations at the CASLab are supported by other measurements made at Halley, including standard and boundary layer meteorology, and total column ozone. For access to these data, contact Anna Jones. 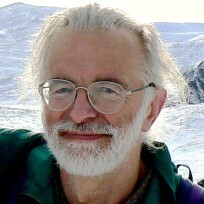 J. Geophys. Res., 111, D08306, doi:10.1029/2005JD006566. Atmos. Env., 41, 5138–5161, doi:10.1016/j.atmosenv.2006.09.053. Atmos. Chem. Phys., 7, 5147–5158. Tellus Ser. B-Chem. Phys. Meteorol., 59, 22–38. Atmos. Chem. Phys., 7, 4171–4185. Atmos. Chem. Phys., 7, 4589–4599. Science 317: 348-351, doi: 10.1126/science.1141408. Environ. Chem., 4, 211–216, doi:10.1071/EN07031. Atmos. Chem. Phys., 8, 887–900. Atmos. Chem. Phys., 8, 2985–2997. Atmos. Chem. Phys., 8, 4085–4093. Atmos. Chem. Phys., 8, 3789–3803. Atmos. Chem. Phys., 9, 4639–4652. Atmos. Chem. Phys.,10, 7775–7794, doi:10.5194/acp-10-7775-2010. Atmos. Chem. Phys., 10, 10187–10209. Jones, A. E., Wolff, E. W., Brough, N., Bauguitte, S. J.-B., Weller, R., Yela, M., Navarro-Comas, M., Ochoa, H. A., and Theys, N.